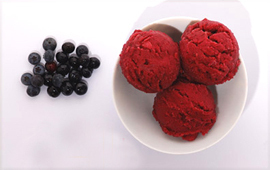 Handcrafted blackberry ice cream from Washington State’s Mora Iced Creamery. STEPHANIE ZONIS is a contributing editor of THE NIBBLE. CAPSULE REPORT: There’s a lot of great artisanal ice cream in the U.S., and you can have most of it overnighted to you. It will arrive rock-hard and delicious. For an ice-cream lover, the cost of this indulgence is not prohibitive: Two people going out for a few rounds of drinks could spend as much as the cost of getting 6 delicious pints delivered to your door. And, the latter is so much more memorable. Here, an overview of the artisanal ice cream movement and some of our top picks. In the beginning, there were good ice creams, sherbets and ices. They were made from fresh, natural, seasonal ingredients, because that’s what was available. They were hand-cranked, because there wasn’t any other way to make them. They enlivened occasions from dinner to ice cream socials...to post-tonsillectomy recoveries. Then came industrialization. These once-noble treats gradually became fluffy, sticky, overly-sweet, artificially-flavored frozen goo, save for the lucky few among us who lived near the tiny number of holdouts who still made their good-quality frozen desserts in the old style. Redemption for the masses arrived, albeit too briefly, in the 1980’s, in the unlikely form of two guys in Vermont who ended up making ice cream because bagel manufacturing equipment cost too much. Yes, Ben & Jerry’s became the darling of ice cream consumers everywhere. There were real people behind ice cream again! Their flavors were creative and tasted great! Their ice creams were a tremendous hit with the public, and they deserved to be; this was a true American success story. Dark indeed was the day that they sold out to Unilever. Say what you will, but Ben & Jerry’s hasn’t been the same since. Setting aside other types of frozen desserts for a moment, perhaps the most common misconception about ice cream in the U.S. today revolves around butterfat percentage. Federal standards require that any frozen dessert called “ice cream” have a minimum of 10% butterfat. Superpremium ice cream must have a minimum of 16% butterfat. Many ice creams advertise a 16% or greater percentage of butterfat, and a lot of consumers seem to believe that this ensures good ice cream. It doesn’t; ice cream does not live by butterfat alone. True, fat carries flavor, but you need other ingredients, good quality ingredients, so your ice cream won’t just taste like cold sweet cream. And all the butterfat in the world won’t redeem an ice cream that’s pumped full of air during the manufacturing process (this is called “overrun” in the trade). I love a good, high-butterfat-percentage ice cream, myself, but I’m seeing more ice creams with lower butterfat percentages these days, and some of them offer excellent flavor. So please don’t base your ice cream purchases solely on butterfat percentage! Most of these artisanal ice creams, sorbets, and frozen desserts are not cheap. And, if you get them shipped, the cost increases substantially. So why would you bother going to the trouble and expense of trying them, when you can go into your local supermarket and pick up a pint of a perfectly serviceable brand for less money? Because food shouldn’t be solely about price. There are times in too many peoples’ lives when price is all that can matter in food, and that’s a different situation. But if you’re lucky enough to have some disposable income, think about what you eat. Food should be about ingredients of great quality. It should be about people who have passion and drive for what they’re making and want to bring you special flavors that you can’t necessarily find at a supermarket. Food should be about saying “yes” to smaller producers, those trying to bring you better, fresher products. (The frozen desserts you order from these companies will be a few days old when they get to you; frozen desserts in a regular market might be months old by the time you purchase them.) To me, and, I hope to you, it’s worth the extra cost to obtain these uncommon products and support the real people behind them. I wish you could have spoken to some of the same people with whom I’ve talked in doing research for this piece. They have an intense enthusiasm for what they do, and all are fierce defenders of their ingredients, processes, and flavor choices. Isn’t that the way it should be? So what exactly makes for a “better” frozen dessert? We’ve already established that high butterfat percentage isn’t proof of a great ice cream, so what is? And what makes a great sorbet or other frozen dessert? Look at the label. As a rule, a better frozen dessert will have a minimal list of real ingredients. You’ll see cream and/or milk (except for a sorbet), sugar, perhaps a stabilizer such as egg, flavors from actual ingredients (like fruits, nuts, or chocolate, not flavorings or extracts), and add-ins such as (real) chocolate chips or nuts. Supermarket ice cream is much more likely to contain flavorings and stabilizers (such as carrageenan, locust bean gum, guar gum, xanthan gum, or sodium alginate), as it must be able to sit for months in your grocer’s freezer without becoming too icy or losing flavor. Unfortunately, frozen dessert manufacturers aren’t required to list the percentage of overrun in their products, but better frozen desserts will have less air pumped into them. Even if your ice cream contains just a handful of real ingredients, if it has a fluffy texture, you can be sure that the manufacturer is cutting corners by mixing more air into the formula. From this, you may deduce that a good-quality frozen dessert will have a creamy, smooth texture. There needn’t be a high butterfat percentage to achieve this; I’ve had some outstandingly creamy sorbets which contained no butterfat at all. Less obvious to the consumer is the amount of labor and care that goes into producing a frozen dessert. Small is not always beautiful here. Just because a neighborhood ice cream parlor opens up, it doesn’t mean they’ll use top-notch ingredients, obsess about their products, or even make their own frozen desserts. Trust your taste buds. Try different frozen desserts; discover what you like. That’s the best indicator of quality I know. Below is a listing, in alphabetical order, of some of these artisan manufacturers and their products. Gelato is not discussed here, as that was the focus of a prior article. Please note that this list is not meant to be comprehensive! I know there are small-scale manufacturers of good-quality frozen desserts I’ve missed here, but I hope to be able to tell you about more companies like these in a future article. Note also that some of these manufacturers sent me product for no or reduced cost, but, with only a couple of exceptions, I’ve tasted products from everyone on this list at some point, and if I didn’t think they were doing good things, they wouldn’t be mentioned. In an era when a first-rate neighborhood ice cream parlor making their own products is a rarity, if you’re lucky enough to live close to one, I ask that you patronize it. But if you don’t, consider trying products from one or more of these companies. Most ship, though they generally have a 4- or 6-pint minimum. Don’t just sit there; grab a spoon and let’s go tasting! Alpine Ice (Marblehead, MA). Described by one co-founder as an “herbal wellness sorbet,” these products are as notable for what goes into them as they are for what does not. They contain no soy, dairy, wheat, egg, or nuts, so people with significant food intolerances or allergies can enjoy them. This company was started by one co-founder after his son successfully overcame a brain tumor and the accompanying harsh treatments, in part through herbs and fruit. Not wanting to deny any child sweets but believing that traditional desserts did more dietary harm than they were worth, the father and son decided they needed to develop a frozen treat that tasted good but wasn’t full of empty calories, preservatives, etc. All Alpine Ice products are sweetened with erythritol instead of sugar or other sweeteners; all contain the fiber inulin and a prebiotic, as well as a green tea-herbal infusion. They contain no fat and are low-glycemic in addition to being low in calories. Flavors range from Plum Lucky to Bolder Berry to the beautifully-named Lavender Sunrise. I have not tried these sorbets. The minimum order is 6 pints; 8-pint increments are available after that. Bart’s Homemade (Northampton, MA). The couple who owns this business were once family therapists. Quite unintentionally, they got into ice cream, a field that they joke provides the instant gratification their former occupation never did! As Shakespeare once wrote, “We are blessed in the change.” Bart’s Homemade has a very modest number of retail outlets in the Bay State, but by great good fortune they also mail-order most of their amazing products (I haven’t tried the sorbets, most of which they also ship; the frozen yogurt is not available via mail-order). What to try first? If you’re like me, you’ll gravitate immediately toward the Chunky Chocolate Mousse with Raspberry, a creation for which I’d cheerfully sell either (or both) of my sisters. Other winners include the Kahlua Sombrero and the Mudpie (coffee ice cream with chocolate sandwich cookies and a fudge ripple). I haven’t yet had the Three Geeks and a Redhead or Jitterzz; for an explanation of these and other intriguing taste combinations, head over to the website. Order some ice cream while you’re there; even in an era when everyone feels guilty about what they eat, you won’t regret it. Fabulous! Online ordering is available. Blackwell’s Organic (Red Bank, NJ). This is a new company with an emphasis I admire; their products are all organic (and, for those of you to whom it’s important, vegan, as well). While they do make soy gelato, that’s not covered in this article. Fortunately for all concerned, they produce sorbetto as well, in a handful of flavors. I first tried their Strawberry and was very pleased with it. Strawberry can be an elusive flavor to capture when you use only real fruit and not flavorings, as is done here, but Blackwell’s has proven that it can be accomplished, perhaps because over 70% of each pint consists of fresh strawberries. 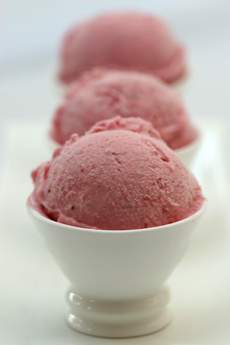 Try, too, the excellent Raspberry Sorbetto, as deeply flavored as the genuine berry itself. And the texture of their sorbetti is just right---not icy nor grainy. I’ll look to try the Blueberry in the near future! Right now, their products are sold in stores in the Northeast and Mid-Atlantic, but they’ll ship anywhere in the U.S.; just call or e-mail for a price quote. Shown: Blueberry Sorbetto. Blue Moon Sorbet (Quechee, Vermont). Here’s a true story: Several years ago now, two friends and I ventured into New York City for the day. We were wandering around and happened into a well-known upscale food store. After eating lunch, I saw some pints of Blue Moon in the freezer case. I’d never heard of the company at that point, but the minimalist ingredient list on the cartons appeared very promising. So I bought a pint of Red Raspberry. The sole man of the trio pointed out that the three of us wouldn’t be able to finish the whole carton. I reminded him that, by sheer coincidence, I’d brought a small cooler and frozen gel packs into New York, so what was left of the sorbet stood a reasonable chance of surviving the trip home. Once the sorbet was opened, however, we all knew none would be left for the cooler, and we finished every bite. These sorbets are bursting with gorgeous, true fruit flavor, and they’re not too sweet. Currently distributed only in New England, New York, and New Jersey. Flavors include Blackberry Lime, Pear Ginger, Grapefruit Campari, and the aforementioned Red Raspberry. If the website is not yet functional, it should be so soon. No shipping, but check your specialty store. Booozah—The Phoenician Frozen Dessert Company (Stow, MA). According to one of the head honchos at this small company, “booozah” is the Arabic word for “ice cream.” Although it’s billed as “gelato with a twist”, I find this product unlike gelato. In fact, it’s unlike anything else I’ve ever had. Booozah flavors are based on Middle Eastern preferences in sweets, such as White Orchid (or “Haleeb”) and Apricot & Raisins (“Amer El Deen”); if you prefer something more familiar, they also offer Strawberry and Chocolate varieties. A key ingredient in Booozah products is Sahlab, made from orchid roots, which acts as a stabilizer and adds an unusual, almost chewy, texture (that sounds bad when you read it, but it isn’t). I’ve tried only the Wild Blackberry (“Toot”), which had an intense fruit flavor and was not overly sweet. Much lower in calories and fat than typical American ice creams, with much less air incorporated as well. An unusual frozen dessert, ideal for jaded guests who insist they’ve experienced it all! Some retail distribution in the Northeastern U.S.; online shopping, if not available by now, should be just days away. IceCreamSource.com (Ephraim, WI). I’ve got a great idea! I’m going to start a business that ships frozen desserts for small companies, the kind who produce interesting stuff but can’t ship themselves because it’s too costly and they don’t have the set-up or staff for it! It is a wonderful idea, which might explain why IceCreamSource.com has beaten me to the punch. This business does have some big names you’ll recognize, but it’s a lot of fun to try the local/regional names you don’t know. While they’re not entirely about frozen desserts, those are the backbone of the company. The best selling flavors of ice cream in the US are vanilla, chocolate, strawberry, and butter pecan; the best seller here is The Chocolate Shoppe’s Black Licorice Ice Cream, which is grey ice cream that really does taste like black licorice. If you prefer less of a walk on the wild side, that company also makes flavors such as Fat Elvis and Mackinac Island Fudge. Michael’s Frozen Custard makes a mighty tasty Cookies n’ Cream; Oberweis makes an interesting Chocolate Peanut Butter Ice Cream, with flecks of “PB” in a chocolate base. IceCreamSource.com hopes to carry the new incarnation of Out Of a Flower, a company I much admired before their untimely demise. Not everything here is what I’d consider “artisanal”, but you’ll be spoiled for choice, there are always some great offers, and you’ll get yourself some good ice cream with a little judicious choosing. Online ordering is a specialty of the house. Jeni’s Ice Creams (Columbus, OH). I’m lobbying to have Jeni Britton designated as a national treasure. Not only does she astonish me with her brilliant flavor combinations and “make it happen” mindset, but she believes in using local, seasonal ingredients as much as possible. This former art history student now devotes her days (and, I’m sure, many a night) to coming up with ice cream flavors that you and I, as mere mortals, would never be able to imagine. Her Lemon & Blueberry is a tart, citrusy delight of an ice cream, with the blueberries providing sweet notes of contrast. I have no idea how she manages to keep the pistachios in her Pistachios & Honey from becoming soggy; they’re crunchy through and through. 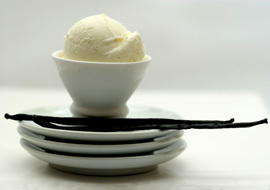 Something that should be commonplace, such as a Honey Vanilla Bean, has great depth of flavor and isn’t too sweet. Even her Berries & Burgundy Sorbet is sublime, and I don’t like red wine. You’ll always find some unusual flavors here (Red Beets with Mascarpone and Poppy Seeds, for instance, or Hibiscus and Grapefruit Yogurt), in addition to more traditional selections. Jeni is going to begin shipping ice cream novelties, too, such as “drumsticks” and ice cream cupcakes. Online ordering is available, but it’s best to e-mail for current flavor selections. Whether you like your flavors wild or mild, you’re going to like these products. 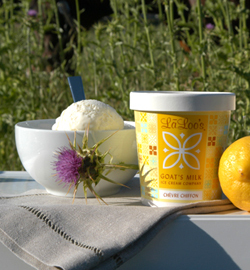 LaLoo’s Goat’s Milk Ice Cream Company (Petaluma, CA). Have you been considering a career change lately? If so, here’s a little inspiration for you. Not very long ago, Laura Howard was a busy entertainment executive in Los Angeles, producing films and commercials. Now, she makes ice cream from goats’ milk. This was an exceptional journey, spurred by a yoga teacher and a love of dairy products, but Ms. Howard is making it work. The goats whose milk she uses roam over 350 acres of luxurious pasture. And I know they give good milk, because you can’t have a good ice cream without a good dairy base. I have a pint of the Vanilla Snowflake in my freezer as I write this. While it’s lower in fat and calories than many American brands, it certainly does not lack in flavor. Like a snowflake on the tongue, a spoonful is subtle and delicate, present one moment and gone the next. Also like a snowflake, one taste of this ice cream is followed by many others! Other flavors include a Black Mission Fig, a strawberry with balsamic vinegar swirl called “Strawberry Darling”, a Deep Chocolate, and a seasonal Chocolate Cabernet. Another nice plus: goats’ milk is better tolerated by lactose-intolerant individuals than is cows’ milk, so this product will be kinder to those who cannot digest lactose. Available in some retail stores in California, Washington State, and Hawaii, but online orders (4-pint minimum) are also accepted. (Read our full review of LaLoo’s, pronounced LAY-loo.) Shown: Chevre Chiffon Ice Cream. Mashti Malone’s Exotic Ice Creams and Sorbets (Los Angeles, CA). Who was Mashti Malone? I’ve read the legend on the company’s website, and I’m still not sure. But I am certain you’ll want to check out the website for their inventive ice cream and sorbet flavors. In how many other places in the U.S. will you find a Rosewater Ice Cream, in two versions, yet (it’s available in Creamy and Non-Dairy varieties)? Not enough flair for you? Think about the Rosewater Saffron Ice Cream with Pistachios, or perhaps the Pomegranate Sorbet (probably my favorite). Mashti Malone’s products all contain a mix of herbs, and all are certified kosher. They are very proud of their ingredients, and their website goes into those at some length. The company has two stores in California and the terrific slogan “2500 Years in the Making”. You can even order rosewater or saffron from the site, by which you will guess that online ordering of their frozen treats is also available, some in well-thought-out assortments. Definitely not the same old thing! (Editor’s note: Mashti Shirvani is a legend in his own time: the eponymous founder and ice-cream maker of these splendid ice creams, a NIBBLE Top Pick Of The Week. When he moved into the space of the former Mugsy Malone’s ice cream parlor, he combined the names. Read our full review of Mashti Malone, a NIBBLE Top Pick Of The Week. Click here to get our Top Pick Of The Week newsletter.) 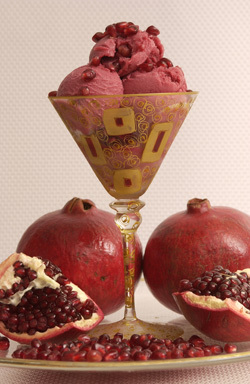 Shown: Pomegranate Sorbet. Mora Iced Creamery (Bainbridge Island, WA). I had never heard of this little company before I started writing this article, but one great thing about researching foods is that you never know what you’ll find, and in this case I’ve discovered a gem. Jerry Perez and his wife Ana Orselli, the owners, grew up in Buenos Aires, Argentina, a city renowned for her ice cream parlors, which double as social gathering places (residents of Buenos Aires meet friends in ice cream parlors as we would meet them in bars or coffeehouses). When they moved to the U.S., they missed both the ice creams and the nice environment in ice cream parlors they knew from their homeland. So, in true entrepreneurial fashion, they started their own ice cream business, and my taste buds are the happier for it. You won’t find any fancy pint cartons if you mail-order products from this venture still in its infancy, but what you will find are taste sensations. You can’t go wrong with the Mora (Spanish for “blackberry,” and it’s a vivid-purple ice cream, not a sorbet). The Gianduja (chocolate-hazelnut) and the sweet, creamy Coconut (another ice cream) are not to be missed. And the filled-with-fruit, sweet-tart Raspberry (sorbet) is a must-try. There are two retail parlors in Washington State. There’s no e-commerce, but you can e-mail the company or call them at 1.206.855.1112 to place an order, something you really should consider doing. Shown: French Vanilla Ice Cream. Taos Cow (Arroyo Seco, NM). It’s entirely possible that Jamie Leeson, the co-founder of Taos Cow, is the single most laid-back individual with whom I’ve ever had contact. Taos Cow was founded by accident, you see. Jamie had been waiting tables and skiing in the winter; during the summer, he was a bike mechanic and guide. Some very slightly used ice cream making equipment became available unexpectedly, and, given the dearth of good ice cream in northern New Mexico at the time, Jamie tells me he and a partner decided to try their hand at producing ice cream “on a whim.” Thirteen years later, he tells me, he’s still “whimming,” albeit with new partners. I’ve never tried this ice cream, but I’ve been hearing good things about it for years. I have little trouble believing those positive reports when Jamie tells me that they’ll use only organic lavender flowers to flavor their Lavender Ice Cream and genuine New Mexico pistachios for their Pistachio. Taos Cow has some traditional flavors, but they make other flavors with a nod to ingredients indigenous to the Southwest, such as their Cherry Ristra (cherry ice cream, roasted pinons, dark chocolate chunks, and cherries) or Chocolate Rio Grande (chocolate ice cream with cinnamon chocolate chunks). You’ll find no attempt to take over the frozen dessert world here, just a small group of people who believe in what they’re doing. They do not ship. The Bent Spoon (Princeton, NJ). The delightful young co-proprietors of The Bent Spoon, a tiny ice cream shop/bakery in Princeton, New Jersey, live by many of the same words that set this writer’s little heart a-pattering. Local. Seasonal. Organic. Fresh. When I dropped by late on a Wednesday morning, the freezer display case held (as it always does) 18 flavors of ice cream and sorbet, and I had plenty of trouble making up my mind. I can recommend without hesitation the superb Dark Chocolate Sorbet, as well as the Organic Three Berry Sorbet. If you prefer ice cream, go for the amazing Chocolate Mint Streak, with a perfect chocolate-mint balance and plenty of miniature slabs of what is obviously real chocolate. The Strawberry Frozen Yogurt is excellent, as well. There are a handful of baked goods from which to choose (including some unfairly cute petite cupcakes), and you’ll find a modest selection of what I know to be good-quality products (such as Rishi Tea in tins and Reed’s Ginger Brew). I’m told The Bent Spoon’s hot chocolate (sold by the cup as well as in a make-your-own tin) is a bestseller. You might well have to wait in line for these frozen desserts, but I assure you it will be worth it. If you don’t live nearby, The Bent Spoon will ship. If you live within any reasonable driving distance, throw a cooler in the car (they’ll pack pints while you wait) and head on over. I love the devotion and enthusiasm I see here! Zambeedo Handcrafted Gourmet Ice Cream (Murrieta, CA). Akshaye Jalan and his wife started this small business with determination, boundless enthusiasm, and little else. Akshaye grew up in Mumbai, which he describes as “a cultural melting pot”; nobody else in his family shared his enthusiasm for good food, adventure, or exploring other cultures. He traveled extensively in Europe and came to the U.S. for his M.B.A., set up, in large part, by a scholarship program funded by Coca-Cola®. Somewhere along the line, an executive suggested that a big corporation might not be the ideal environment for Akshaye’s progressive nature; why not take a crack at starting his own business? He decided to follow that advice. Akshaye admits to having a sweet tooth, and eventually, after a good deal of research, he and his wife settled upon the idea of making ice cream. Surprised that American ice creams distinguished themselves solely by fat content, the pair wanted a healthier frozen treat, but still one in which they could taste the ice cream’s chief ingredients. The resulting ice cream is lower in fat, calories, and cholesterol than many others (it also contains no eggs), but it is quite flavorful. Try the Crème de Mango (mango is the first ingredient, just the way it should be), the Crème de Chocolat or the more exotic Crème de Rose. One note: some of these ice creams do contain liqueurs, but they are used with a delicate hand, and Akshaye was at some pains to explain that any alcohol content disappears during the freezing process, leaving behind a subtle taste and “nose.” All eight flavors are available by mail from IceCreamSource.com; you can also e-mail Zambeedo directly (information on website).